Mara is a proud and beautiful slave girl who yearns for freedom. In order to gain it, she finds herself playing the dangerous role of double spy for two arch enemies - each of whom supports a contender for the throne of Egypt. Eloise Jarvis McGraw was an American author of children's books and young adult novels. She won the Newbery Honor three times in three different decades, for her novels Moccasin Trail (1952), The Golden Goblet (1962), and The Moorchild (1997). A Really Weird Summer (1977) won an Edgar Award for Best Juvenile Mystery from the Mystery Writers of America. 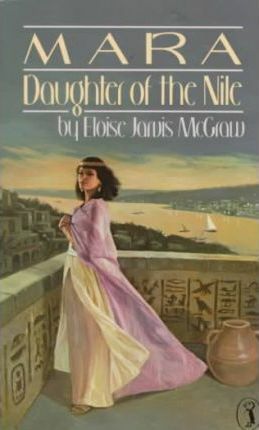 McGraw had a very strong interest in history, and among the many books she wrote for children are Greensleeves, The Seventeenth Swap, and Mara, Daughter of the Nile. A Lewis Carroll Shelf Award was given to Moccasin Trail in 1963. She also contributed to the Oz series started by L. Frank Baum; working with her daughter, graphic artist and librarian Lauren Lynn McGraw, she wrote Merry Go Round in Oz (the last of the Oz books issued by Baum's publisher) and The Forbidden Fountain of Oz.